Protect your benchtop while performing the perfect tamp with Crema Pro’s tamper mat. The mat provides a sturdy base in order to tamp coffee grind with a consistent distribution of pressure across the whole surface, which is key to producing delicious tasting coffee. Made from food-grade compound rubber. A tamping mat is an essential part of any professional baristas kit. Its main purpose is to protect surfaces from damage when tamping, which is essential for a restaurant, coffee shop, cafe or any other business. This black tamper mat is made from food-grade rubber compound, which provides practical qualities as well as a professional look. It is easy to clean, offers fantastic protection and has a smooth, aesthetically pleasing appearance which is ideal for businesses who have their coffee set up on show to customers. The perfect product to pair with this mat is the wooden coffee tamper which showcases a stylish wooden handle and a premium stainless steel base. What is a coffee tamping mat for? The main purpose of a tamping mat is to protect your surface from scratches or dents. When making an espresso, ground coffee is poured into the portafilter which the needs to be tamped to create a compact puck of coffee. There is usually a two-way spout underneath a portafilter where the espresso pours out, which can make it difficult to balance on a surface and the metal can cause damage to a work surface. 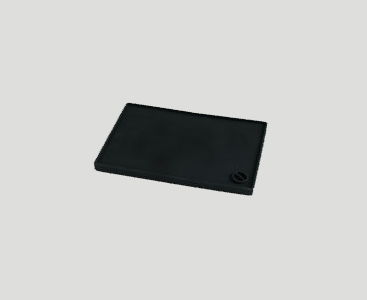 A thick rubber tamper mat stops the metal from coming in to contact with your surfaces and protects it from becoming damaged. It also provides a more stable surface that is safer for the portafilter. As pressure is applied downwards by the barista when tamping, the portafilter could easily move if placed on a slippery surface such as plastic, marble or even wood. The high-quality rubber material of this product creates enough friction to prevent the portafilter from moving during tamping. It also makes sure the mat stays in place and doesn’t move across the surface. Another benefit of this product is that it maintains a clear defined space for making an espresso. Often in a busy coffee shop trying to find free space is a task you simply don’t have time for. Having a designated mat means that you will always have enough room for creating an espresso and a designated area that baristas know to use for this particular task. If you use an espresso machine for your business, a tamper mat is an essential part of your barista kit. Tamping is for espresso making, so a mat isn’t required for small home brewing devices. It is much better quality than instant granules. Take a look at our espresso machine guide to see what other features you receive with this worthwhile investment.